Awards and Recognition - Central Research, Inc. Since the company’s inception, Central Research, Inc. has been recognized for our performance as a thriving service provider. Most importantly, we have been recognized for hiring Veterans. The company started with a single goal: “Create a strong, vibrant business that employs Veterans and disabled Veterans”. Our awards are in direct relation to all our employees’ hard work and dedication. Each year, Inc. 5000 celebrates the fastest-growing private companies in America by publishing an annual list of honorees. Central Research, Inc. has made the Inc. 5000 list six years in a row. In 2012, Central Research was ranked #703 overall with a three-year growth rate of 253%. CRI was also ranked #88 in the list of Top Government Services Companies, and #3 in the list of Top 100 Arkansas Companies. In 2014, CRI received the 2013 Spirit of Rogers-Lowell Award. This honor was bestowed upon CRI by the Rogers-Lowell Chamber of Commerce in recognition of their significant contribution to the betterment of the community. Central Research was recognized for giving above and beyond to the community through its involvement and leadership within the Northwest Arkansas Toys for Tots foundation and its own internal organization Operation H.O.G. (Handing Out Gratitude). In 2013, CRI was named one of eight small business finalists for the U.S. Chamber of Commerce Foundation’s Hiring our Heroes program. The U.S. Chamber of Commerce and Spike TV’s Hire a Vet campaign named eight finalists to compete for the “Most Veteran-Friendly Small Business in America” challenge. The finalists were judged by their innovative recruiting and retention strategies for Veterans, Veteran community engagement and leadership, as well as an ongoing commitment to hire Veterans. Hiring our Heroes was created in 2011 as a nationwide initiative to help Veterans and military spouses find meaningful employment. Hiring our Heroes has hosted more than 500 job fairs across the country and has helped over 18,000 Veterans and military spouses obtain jobs. In 2012, CRI was named a Top 100 Disabled Owned Business in America. Each year, Diversity Business collects information from businesses nationwide to compile the “Top Businesses List” on the state and national level to determine the most successful entrepreneurs across the United States. In 2012, the U.S. Small Business Administration (SBA), Arkansas District Office seeks successful and inspiring entrepreneurs to represent the state of Arkansas during the annual National Small Business Awards. Business winners are selected based on staying power, growth, innovativeness, adversity, and community contributions. In 2012, CRI was named the SBA Veteran Small Business Champion for Arkansas and Region VI. In 2012, the U.S. Chamber of Commerce named CRI a Blue Ribbon award winner as the Dream Big Small Business of the Year. The Dream Big Small Business of the Year Award celebrates the success of small businesses and honors its contributions to America’s economic growth. Companies were judged on staff training and motivation, community involvement, customer service, and business strategies and goals. In 2011, Johnny Dillard, PhD, former Chief Executive Officer (CEO) of Central Research, Inc. was named the Arkansas Minority Small Business Person of the Year by the U.S. Small Business Administration (SBA) Arkansas District Office. Each year, the SBA seeks to honor outstanding entrepreneurs in the state of Arkansas for overcoming obstacles with creativity and perseverance to help create jobs for themselves and others. The person is selected for staying power, as evidenced by a minimum of three years in business, growth in number of employees, increase in sales, innovativeness of products or services, response to adversity and contributions to community-oriented projects. In 2011, CRI was selected as the Mentor Protégé Team of the Year by the U.S. Department of the Treasury (Treasury). CRI was honored alongside teammate HMS TECHNOLOGIES. The selection criterion for this award was based on commitment to the Treasury, vendor relationships, and demonstrated growth in business development. CRI was commended by the Treasury, Director of Small Business Programs Office for our contribution and service to their Small Business Program. In 2011, Scott Dillard, President of Central Research, Inc., was named one of Arkansas Business’ 40 under 40. Each year, Arkansas Business honors 40 business and political leaders under 40 years old in the state of Arkansas that have made an impact on their company or community, and show potential to be a leader in business or politics over the next decade. Scott Dillard was selected from more than 300 nominations. The Small Business Council of the Rogers-Lowell area Chamber of Commerce proudly provides special recognition to the small business community by presenting monthly recognition awards. Small businesses are the backbone of the community, and the Small Business Council takes this opportunity to recognize exceptional small business owners for their tireless work, contribution to the community and embodiment of the spirit of enterprise. More than 99% of all small business employers create three-fourths of all new jobs and account for on-half of the nation’s gross domestic product. 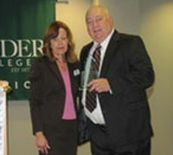 CRI was the Small Business of the Month Award winner in both 2009 and 2012.